Share the post "146 – 12th St. NW"
It was another creepy early morning with the heavy fog moving around the low lying areas. I can’t remember seeing it so thick during this time of year. It actually reminded me of something one would see in a Dracula movie. Thinking it wasn’t going to be as hot as predicted, I was proven wrong when I noticed the outside temp being 92 while driving to an appointment this afternoon. At least we’re getting a bit of a breeze which is helping with this humidity. Knowing I’d have some free time this morning, I called one of my clients yesterday and asked if he would mind if I picked the Concord grapes growing along his mother’s fence line. I’d noticed several days ago that the birds and animals were already after them which is usually one of the signs they were ripe enough to pick. He was more than happy I was willing to pick them and put them to good use. So after changing into work clothes and spraying myself up and down with bug spray, I went over there and picked as many as I could reach. After about an hour and a half of non-stop clipping, I finished up and loaded them into my car. I’d say there was a little over a bushel of them. I took them home and put them in cool storage so I could work on them later. As you all know, I was raised on a farm where many fruits and vegetables were either canned or frozen. After numerous attempts to grow grapes, they were dismissed as not being tolerant to our soil, so that was the end of having anything to do with grapes. I later learned that grapes absolutely do not like having “wet feet” when growing which answered the question as to why they wouldn’t grow. I guess when you think about it, most times we see photos of grapes being grown on hillsides and sloping fields which tells us again they must have good drainage. Since we never made grape jam, I’ll be trying my hand at it these next several days after getting them prepped. In just the short time they were in my car, I could smell grapes lingering long after I they were removed. The recipe I found on the internet is supposed to be a tried and true one with many reviews, so if the grape jam does turn out as the reviews stated, I may be giving half pint jars of grape jam as Christmas presents. I vaguely remember having eaten homemade grape jam, but it’s been so many years ago that my taste buds aren’t able to recall. I did get that offer put together on another Realtor’s listing today, and I’m pretty confident it will go to closing. The buyer is very happy now after the many and days of viewing numerous homes. I mentioned again, just as I have before, “If you take care of that home, it will all the more take care of you.” Having now been in it twice, I’d say it has a good “feel” which speaks volumes since I’m growing all the more jaded due to the number of homes I’ve inspected over these long years. 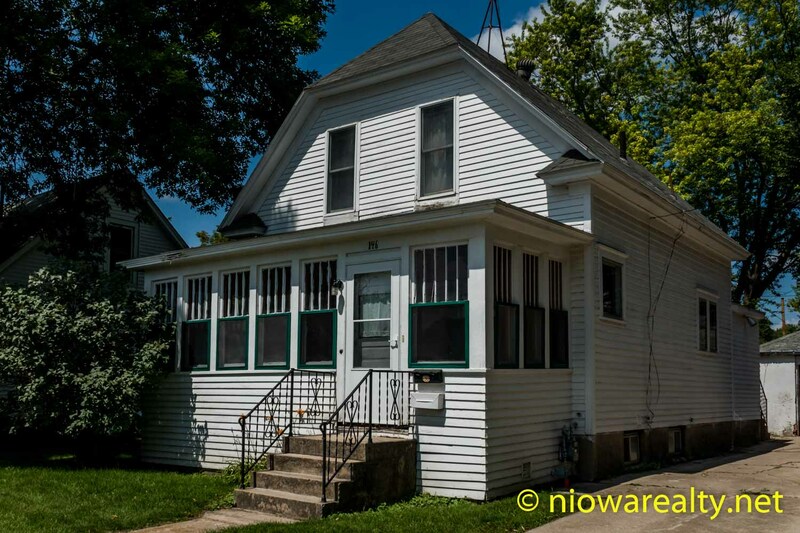 I just received back the listing documents from the executor of the home I’ve posted today which is located at 146 – 12th St. NW here in Mason City. It’s a roomy 3 bedroom that’s been in their family for well over 50 years. It does need some cosmetics, but well worth the time and money because of the listing price which is $49,500. Now where can you find a home in a desirable neighborhood that has 3 bedrooms, newer wiring, newer thermal windows, hardwood floors, and a big yard? A person could throw $5,000 of improvements at it, and what you’d find would be a comfortable family home. I do hope it doesn’t end up in the inventory of the rental barons. The payment on it would be hundreds of dollars less that what rent would be for a similar home. I absolutely love the enclosed front porch with its terracotta tile flooring. Don’t let 146 -12th NW deceive you, because it’s gonna make someone a very liveable home at an inexpensive price. The above photo is an exterior shot. Tonight’s one-liner is: Education is an ornament in prosperity and a refuge in adversity.